I had intended to take EJ and Elsa karaoke at this place near our house. It was $1/hr/person for the morning. But then, Elsa was sick. 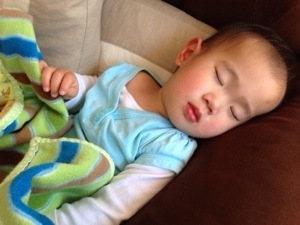 She was sick two days before with a fever. And her fever still had not gone down. So we stayed home. Elsa just wanted to be carried and cuddled. She was so weak, she just fell asleep on the couch. She’s never done that before. Well, after a huge nap, Elsa’s fever went down to 100F. She was having 102-103 fever that day. Good thing it went down, so we decided to just go out for a quick dinner. 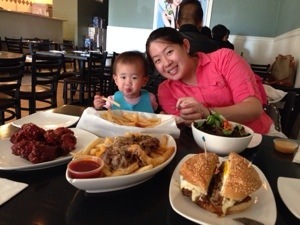 We went to a Hong Kong bistro near our place and we ordered all my favorite foods. Elsa even had her appetite back, so she ate well. We also spent two nights at a nearby Marriott hotel this weekend. Eric had some free nights that needed to be used up by the end of May. We chose this hotel because it had an indoor pool. Something the kids would enjoy. My birthday meal Round 2 was at this Korean fusion place. It was so yummy. They’re known for their fries (topped with melted cheese and bulgogi meat) and Seoul burger (beef patty with bulgogi sauce and egg with semi-runny yolk). Their rolls were delicious too. 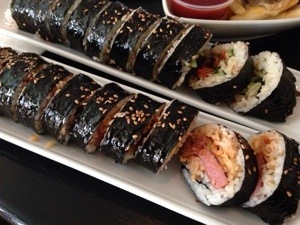 Spam and kimchi roll and bulgogi roll. Even better was that everything was really cheap there! So we ate a lot. Lol. 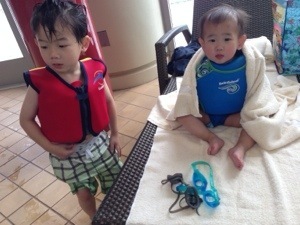 The kids enjoyed the pool. It was Elsa’s first time swimming. We took her to a pool last year, but she spent the whole time in a float. This time, she went in the water. She absolutely loved it. 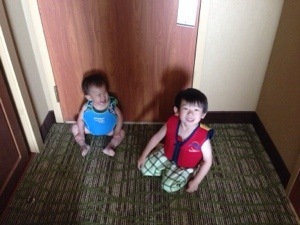 They were so exhausted after the swim. I’m so tempted to buy a kiddie pool for them. Especially since it’s gonna be hot next week! The worst part about this whole weekend trip was the night time. We only got one king. They were all out of two doubles. So the four of us all squeezed onto one bed. Lol. It was hardest on Elsa. She’s so used to sleeping in her own room and in her own bed. She couldn’t sleep with all of us around. She didn’t sleep well at all. We were so tempted the second night to just drive home to sleep. But EJ insisted we all stay. Lol. I put Elsa down to bed just now and she was so happy to see her crib. She rolled over contently and fell right asleep. Icing on the cake today: Eric sat with us for the first time at sacrament. He’s been released from the branch presidency. This is the first time we get to sit together as a family at church, other than stake conference. He’s had the calling before EJ was born, so EJ was excited that daddy gets to sit with us. And Eric realized how wiggly his kids really are. I got to listen to the talks and sing my hymns while Eric was trying to not let them army crawl their way under the benches. Fun times! 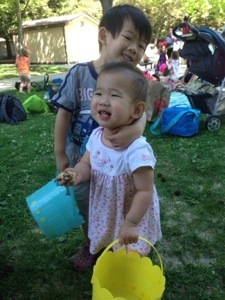 The kids had THREE Easter egg hunts this week! That’s a lot of chocolate! Ready to go get some eggs! Our second hunt was at home. It was spring break this week for some of the kids in our branch. EJ had spring break too, so we invited some friends over. 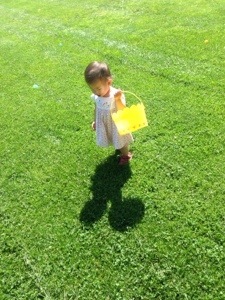 We painted eggs and had our own little egg hunt in our backyard. 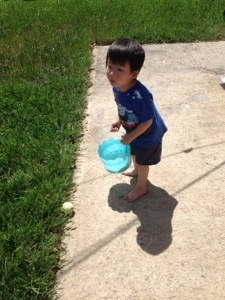 EJ looks really sad in this photo because I wouldn’t let him dye another egg. 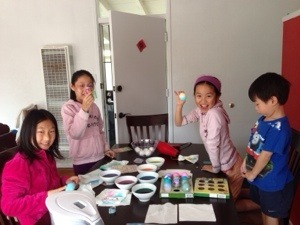 He’d already done five eggs (by dunking them in almost every color), while the girls were still on their first! 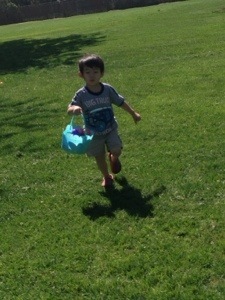 Well, granted he was very excited because it was his first time dying Easter eggs. Elsa munching on some chocolate. I think this is the first time she’s had so much chocolate. Their third hunt was inside our house. Eric and I actually spent a day in Oakland and San Francisco for our friend’s wedding. Their sealing was at noon in Oakland and their reception was at 6 in San Fran. So we got Eric’s cousin to babysit the kids and we spent a day in the city! After the temple sealing we drove into the city, caught a movie, and walked around a bit. It was nice not to have to chase two kids down! 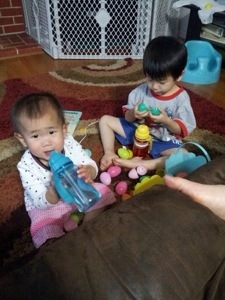 Anyway, Eric’s aunt and uncle came over and they had a little egg hunt for EJ and Elsa inside the house. They filled the eggs with goldfish. Good thing, otherwise the kids are seriously chocolate overloaded this week! 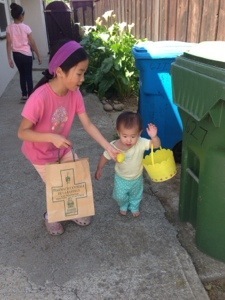 It was a lot of fun and I had a lot of the kids’ chocolate, but I never understood what bunnies and egg hunts had to do with what Easter is really all about. 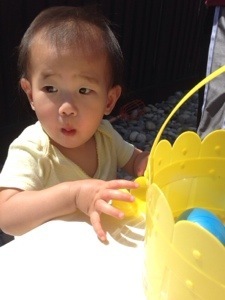 EJ told me a story earlier this week about Easter. He told me Jesus ate fish and honeycomb. That Jesus had nails in his hands and feet and he died and then came back after three days. I’m so grateful for his primary teachers that taught him this! For this is the true meaning of Easter. 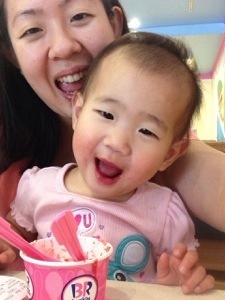 Every time we pick up dry cleaning, we end up getting ice cream. That’s because Baskin Robbins is right next to the dry cleaners! 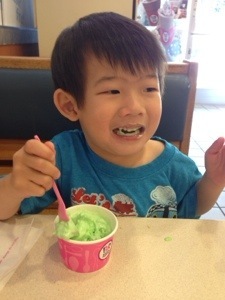 EJ really REALLY wanted ice cream. He said he really needed it. Lol. That kid is very dramatic. 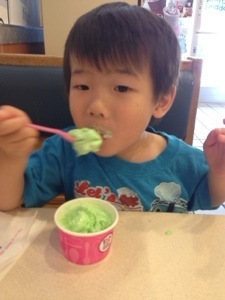 Anyway, how can I say no to ice cream. 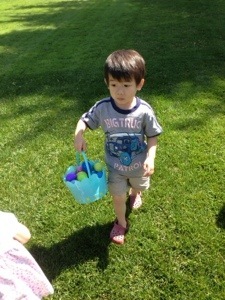 EJ with his Easter Egg Hunt flavor. 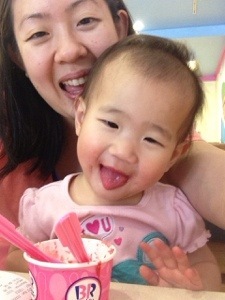 Elsa and I shared a strawberry cheesecake flavor. So yummy. I love the huge chunks of cheesecake in there. Eric said I needed to start blogging again. Yeah… It’s been a while. We were busy getting settled into the new house and so didn’t have time (or energy) to blog. And it’s been so long that it’ll take forever to catch up, so I just kinda gave up. Haha. Anyway, I know I definitely need to pick it up again. I finally decided to blog again today because of something that happened to EJ today: his first heartbreak and rejection! EJ is completely in love with this girl at school. Every time I pick him up from school, he tells me what he did with Juju that day. “Mommy, I sat next to Juju. Mommy, Juju played with me. Mommy, Juju is nice to me.” One time, out of the blue, he told me, “Mommy, I like a girl. I like Juju.” Haha. I think it’s so cute! He would always give her a hug and say bye to her and only her when it’s time for him to go home from school. Today, he told me something so sad. 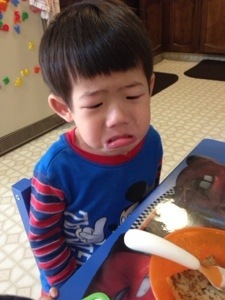 He said Juju told him that she wanted to play with Jazmine today and not him. She told him that she likes Jazmine. He was so sad! Look at how sad he was. I thought it was funny, I had to take a picture. He’s so dramatic. 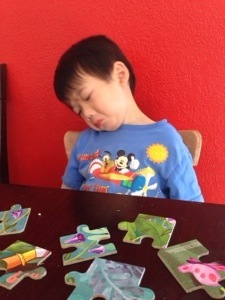 We were just making a puzzle together and all of a sudden he just told me how sad he was. Well, we had a snack and he felt much better. I love talking to this little guy. I love the conversations we have every afternoon when Elsa is napping. So precious. I hope that as he gets older, he’ll still be willing to tell me things. Going to bed for the very last time in this house. I’m going to miss this place so much! We’ve called this place home for the past two and a half years. The longest we’ve ever been at a place since we got married. While I’m excited for our new home, lots of memories were created here that I’ll always remember. This place is the very first house I’ve ever lived in with a backyard, garage, the whole shebang. I’ve only ever lived in apartments before this. Although not EJ’s first home, he spent most of his life here. He turned one (and two, and three) here, took his first steps here, potty trained (with many accidents) here. 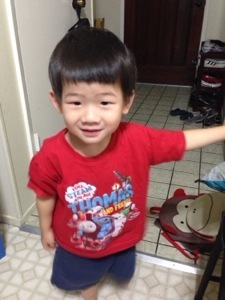 He experienced many, many firsts in this house. He knows the way home when we’re driving in the car. Tonight, we had to make a quick stop at our new place before coming back here for the night. We drove right past our street and EJ quickly exclaimed, “Daddy you missed our house!” I think he will definitely miss this place. This is the home he knows. I hope he can adjust to his new house! I know kids are really adaptable. 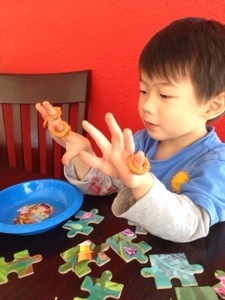 EJ is a creature of habit, though, so it might take him a while. He does have a new race car bed with Lightening McQueen bedsheets at the new house. So that might help! This is little Elsa’s first home! 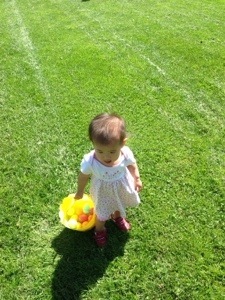 She turned one here and took her first steps here (technically at our neighbor’s house, but close enough!) She probably will have no recollection of this house, but we will! I’ll definitely remember how she likes walking on the carpet and not on the linoleum in the house; how she learned how to go down the steps all on her own; and how she loves pulling out all our shoes from the shoe rack and putting on our shoes (no shoe rack at the new place!). Hopefully she’ll be able to adjust to the hardwood and tile floor in our new house! I remember when we first moved in. I was SO not used to it! I thought it was too quiet and too dark! We moved here in the summer so I encountered many spiders in the house. One right above my head while I was lying on the bed. Yikes! I missed having aircon, fancy granite countertops, two bathrooms, upgraded kitchen appliances, among other things that our previous apartment had. And now that we’re leaving, I’m going to miss so many things about this place. Many good memories were made here. And I’m sad to leave. I’ll miss our wonderful neighbors. Thankfully we’re only moving a mile away and we can still visit frequently. This place has been good to us. I’m nervous and excited about finally being a homeowner! No more calling up the landlord to fix things. Eric needs to learn to be a handyman! I should learn, too. Hehe. Moving forward! Goodnight 381 Harvard Ave! This is our last night here. We’ll miss you! Thank you for all the wonderful memories! It’s really depressing looking for housing in the bay area. Housing is just so expensive!! We’re looking to buy a house in the $600,000s. There was one house we saw going for $650K and it was a fixer-upper!! And would only take cash offers. We’re in this price range where we’re losing out to investors who can make cash offers. I thought we would be able to find a house by now, but looks like it’ll stretch until next summer. We’re outgrowing our home now. EJ really doesn’t have anywhere to sleep, so he sleeps on our bed. For a while, he was sleeping on the floor in our room, but he decided that he just wanted to sleep in the bed. I would, too! Every weekend is spent at open houses. And weekday nights spent looking at homes with our agent. It is a seller’s market now, and we haven’t had much luck with our offers. Anyhow, we’ll just keep looking. And hopefully find something soon! EJ’s been attending a new school for the past two weeks. He goes twice a week for half a day. I was really looking forward to him attending this school since it’s a bilingual school, meaning he’ll be exposed to Chinese. 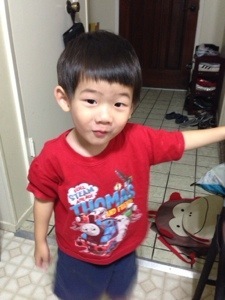 We don’t speak much Chinese at home, so I really hoped that he can pick up the language. Sad to say, EJ’s been hating it. Whenever I talk to him about going to school, he tells me that he doesn’t want to go to school. The past couple of times he told me he wants to go to the other school. Tonight he told me he wanted Miss Kat. That’s his teacher from EJ’s previous school. He was so sad when he said that. It really broke my heart! I wonder if this is a right fit for him. He really seems to hate it. He was so good on the first day. No tears. He said bye and we left and that was it. Ever since then, it’s been tears every morning. I hope it’s just a phase. I really hope he gets over it. I don’t know if I should pull him out if he’s still hating it by the end of the month. Or just stick it out, let him adjust and hope the Chinese language rubs off on him. I read someone’s blog a while back and she documented the reasons why her kid cries. I thought it was so hilarious. EJ is a super OCD kid. He’s very particular about how things are done. And if they’re not done right/he’s way, he freaks out and is super upset! I thought I would try documenting some of his “OCDness”. 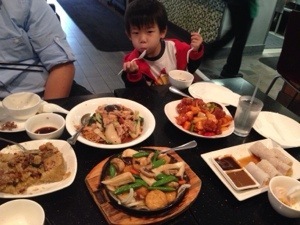 Yesterday morning at breakfast, EJ got upset because I cut his radish cake (Chinese pan-fried radish cake). He kept crying for me to “fix it”. Obviously can’t uncut something that’s already cut, so I had to give him a whole new piece. 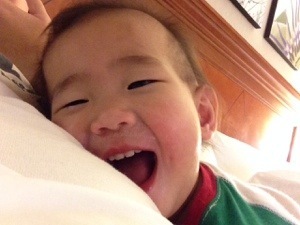 After two weeks of adventure in Hong Kong, Eric and EJ are back! When I picked them up from the airport, EJ hugged me so tight, my heart about melted. How I missed my little munchkin! I have to say, I had a really nice break though! I didn’t accomplish the entire list of things I wanted to do, but I was very relaxed! EJ manage to sleep really well on the flight again. A whole 9 hours of the 11 hours on the second leg back. But boy was Eric tired! He said he only got about two hours of sleep. When they got home, Eric was ready to crash. 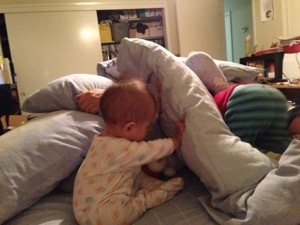 The first thing EJ did though, was go play with his toys! Even after a nice long bath (i.e. EJ playing with water in his “boat”), he didn’t want to sleep. I stayed up with him until about 1am, then had to pry his toys away and force him to sleep. Well, he slept all right, but it was more like a nap! He woke up after only about 5 hours. Yikes. Anyway, we were planning on going to watch Planes in the theaters this morning. That didn’t happen. Eric was really tired! I made him stay awake until noon so at least he could just have an afternoon nap. EJ was happily playing with his toys. I was waiting to see when he’ll crash. And at about 1:30 just now, he went and laid down next to Eric. Lol. Which is a good thing, cos 1:30 is his normal nap time. That’s what I hate about traveling to Asia. The jet lag! Elsa took over a month to sleep through the night again after our trip to Singapore, and I’m glad I decided not to take her. It’ll take a while before EJ will get back on schedule again! He has about 2 weeks, since he’ll be starting school again then! Playing together again. EJ says he needs to hide the gator (Eric). Haha. Kids come up with the funniest ideas. 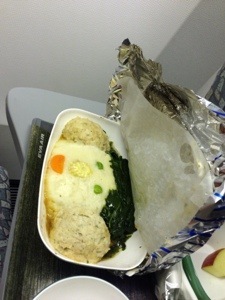 EJ’s cute kid’s meal on the plane. You laugh because I'm different. I laugh because I farted. 249 posts and 224 comments.